Sasinowski, and Jo and Frank became sweethearts in their early teens. They especially liked to skate together on the pond at Central Park. During WWII, Jo worked at GE and kept up with Frank with long letters and they married at Holy Cross Church in October 1949. They thought they had kept their honeymoon at Lake Luzerne a secret but were surprised by both sides of the family coming up to visit and then, leaving Frank’s younger brother Jack to stay with them. Jo relished the holidays and enjoyed the outdoors and liked music. She would decorate every corner of their small home and would fill the backporch with huge boxes of various holiday cookies that she would dole out to any visitors to take back to their homes. When Frank was approaching retirement from GE, Jo decided to take up golf as a way to be with Frank once he retired. Not only did she become good enough to win trophies and tournaments, but she would bring bags and collect wild mushrooms and 4 leaf clovers while walking the fairways. Many in her family still have a laminated 4 leaf clover from her. When her children were young, she would bundle them up and take them sledding in Central Park or skating down a stream. In her home the stereo always had a Dean Martin, Al Martino or Mitch Miller LP playing while she was doing her housework. Jo was tremendously handy and in addition to being a good cook, she could do electrical and plumbing as well as hang wallpaper. She advised brides to “play dumb” and not let spouses know how much one knew how to do! She cared not only for her family, both immediate and others, but also for those around her including neighbors who she cared for including shopping and cleaning for those unable to do so for themselves. Jo loved to have people come over and visit. She would put out a spread from whatever she had in the kitchen and guests felt treated like royalty. She had always baked and shared, as her daughter and son had friends in college who looked forward to her care packages, and she did the same for her grandchildren when they were in college. However, once she was living alone after Frank passed in 1981, she really took to baking cookies for everyone, including the mail man, the trash collectors, and the people who worked at her local bank branch. She cared for her family including coming by and spending one month each summer and one month each winter with her daugther and her two grandchildren in New Jersey. Whenever her son come up with his family from Virgina, she always had something special to do or share with these three grandchildren. In her later years she had to move into Ingersoll and then, Glendale. When her son or daughter would visit, she would enjoy their company for awhile and then, tell them to go and get out into the world and enjoy the sunshine and people and all the good that is out there to embrace. Go and live with gusto and zest seemed to be her motto for all of us. Jo richly displayed that in her life. Jo was predeceased by her husband Frank who she longed to be reunited with since his passing in 1981. Jo’s grandson Tom says that Grandma Jo chose to leave us now so she could spend Valentine’s Day 2019 with Frank. 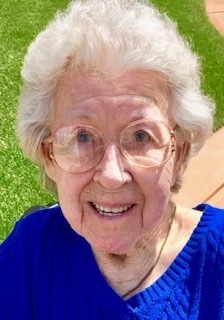 Her brother and sister, Frank and Helen Zebuda, as well as all her brother-in-laws, Frank Szychulski, Matt & Jack Sasinowski, and sister-in-laws, Anne Zebuda, Wanda Szychulski & Jessie Sasinowski have passed as well as a granddaughter Patricia Powell. Jo is survived by her two children and their families: Barbara & George Powell, Bryon Powell and Meghan Hicks, Gretchen and Jon Kish and two greatgrandaughters, Maya and Norah Kish as well as Frank & Jackie Sasinowski, Tom Sasinowski, Katie & Mike Nedelcovych and greatgrandson Miles Nedelcovych, and Laura and Ethan Cox. To all Jo’s rest of her family and friends including those who cared for her so lovingly at Ingersoll and at Glendale, the surviving family extend our blessings and love to each of you from our Mom who we are confident is pleased with each of you and continues to love and care about each of you. A Mass of Christian Burial will be held on Saturday, February 9, 2019 at 9:00 a.m. at St. John the Evangelist Church. Interment follow in Holy Cross Cemetery.